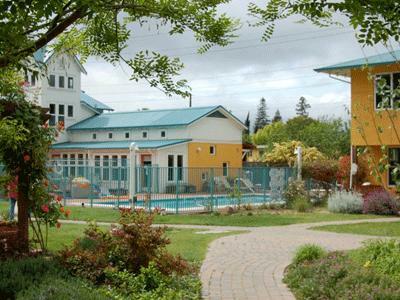 We are a suburban cohousing community on 2.2 acres in Pleasant Hill, California, (near Walnut Creek, east of San Francisco). We have 32 self-sufficient townhouse-style units along with a common house (kitchen/dining room, sitting room, laundry, and kids’ room), workshop, organic garden, kiln, pool, and hot tub. We used energy efficient green building features in our original design and added photovoltaic solar panels after move-in. A hiking/biking trail, an elementary school, and various shops are all nearby. We moved in fall 2001. Please see our website for more information about our community.